Autumn is by far the most fashionable of seasons, in my opinion. It's one of the only seasons where you can get away with wearing almost anything...skirts, shorts, capris, pants, long sleeve, short sleeve, sleeveless, sweaters, jackets, scarves, hats...you name it! I love layering several high-fashion garments together to create a unique ensemble, but I also love being comfortable and choosing clothing made from sustainable fabrics, which is the best option for our planet. I've been a long-time fan of Gaiam for I have an untold amount of top-notch yoga and pilates workout gear and videos of theirs. I recently came to learn that they also have a large selection of all natural clothing, including one rocking new line just for fall. Keep reading to learn more! The Turtleneck Swing Top from Gaiam is a new twist on a fashion staple. When the weather turns cold, there's nothing like a beautiful turtleneck to wear by itself or layered under a warm sweater. Since longer lengths and flowy fabrics are what's hot this year, Gaiam changed the classic turtleneck to incorporate these elements. What's more, they've managed to make this one hot, environmentally conscious number too, for this turtleneck is composed of 95% bamboo viscose, a sustainable fabric. The result is one extremely soft and silky top that is thin and works well as a stand-alone top or layering piece. The figure-flattering A-line cut of this turtleneck ensures that any extra "muffin top" you might gain during the holidays stays hidden from view! 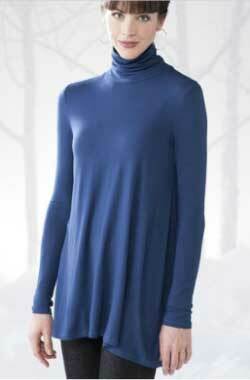 The Turtleneck Swing Top is 29.5" in length from neck to hem and is completely machine washable. It comes in two shades, purple and ocean, and I simply adored the gorgeous deep blue color of the ocean variety. Unfortunately, here in Texas, we haven't received a cool enough day yet so that I can wear the Gaiam Turtleneck Swing Top out in public, but as soon as we do, I know that I will receive a ton of compliments on this eco-friendly, figure-flattering top! 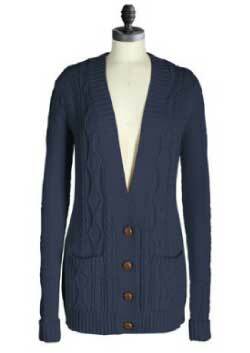 Of course, the coup de grace of the Gaiam Fall 2011 Collection, in my opinion, is the Heirloom Cable Cardigan. This is one fashion essential which will never go out of style, for it has timeless appeal that will be "in" season after season. Gaiam has made this an environmentally responsible garment because it is composed of 50% organic cotton and 50% Merino wool. These two fabrics coupled together make for one super soft and snuggly sweater. I absolutely adore this knit cardigan for it has a loose, comfortable fit that's perfect for every day and features a lavish cabled button-front V-neck. The four dark brown basket weave buttons, cuffed sleeves and generous front patch pockets complete the highly detailed style of this cardigan. I highly recommend both of the eco-friendly fashions I reviewed from the Gaiam Fall 2011 Collection. The Turtleneck Swing Top and Heirloom Cable Cardigan have so much style and versatility that they could easily be paired with numerous items you already have in your closet. If you want to update your wardrobe with classic fashion staples which are also good for the environment, then don't hesitate to purchase any of these natural clothing selections from Gaiam! Disclosure: I received the Heirloom Cable Cardigan and Turtleneck Swing Top from Gaiam in order to facilitate my review. No other compensation was received. This product review is based on my own personal experiences with this item and is completely honest and objective.